• Water-repellent leather and wear-resistant nubuck leather and PU upper. • HiPora® three-layer waterproof, breathable membrane. • Geometric embossed pattern on inside of boot for additional grip. • 100% polyester lining and breathable open cell foam for increased comfort. • Anti-twist, unbreakable molded nylon midsole. • 3M™ reflective heel inserts for added visibility. • Oil- and petrol-resistant vulcanized rubber single density compound rubber sole. • TecnoGI thermoplastic heel cup and toe cap. • Dual replaceable and adjustable rust-free alloy buckles aid a secure fit. 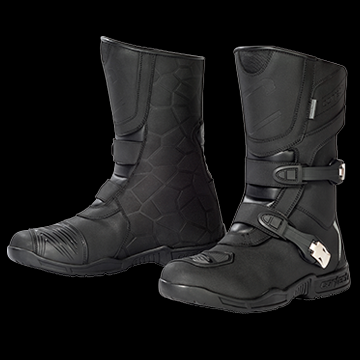 • Hook and loop calf closure for added adjustability and safety. • Molded nylon shin and ankle guards backed with shock absorbing material. • Triple-density, pre-molded, anti-bacterial, and anti-fungal fast drying insole. • Shock-absorbing dual high-density foam and molded nylon ankle and shin guards.